That brings back so many memories of my childhood. AAAAAHHHH!! THE WORD WE CAN NOT STAND!!!!!!! WE THE KNIGHTS WHO SAY NEE! No Loki you’re doing it wrong! Allow a master to demonstrate…Ahem…NI NI NI!! !You are to cut down the tallest tree in the forest with…a HERRING! Baby is cousin’s It child obviously. What? You never heard of someone being called the new “It” girl? You must bring us…ANOTHER SHRUBBERY!!! We are no longer the Knights who say NE! We are now the Knights who say Ekke-Ekke-Ekke-Ekke-Ptang-Zoo-Boing-Zow-Zing! Uncle Marvel looks like Reid Fleming, world’s toughest milkman. 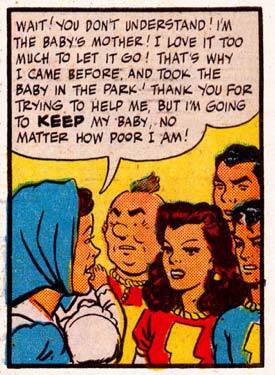 I guess her inability to remember the baby’s gender probably accounts for the nonplussed looks on the faces of the Marvels. How can they believe her if she can’t even remember that detail? And even if they do believe her, can she possibly be a fit mother? But if they assume she’s lying and take the baby, how bad will they look later if her story checks out? Ah, so the baby is a hermaphrodite. That explains the whole it thing. My wife loves when I call our baby “it”. She lets me sleep in a tent outside when I do it! Monty Python + Funny comics that sometimes makes no sense = Everyone staring at me in computer class because I just choked on my laughter. @ Gero: NO! NOT A SHRUBBERY!!!! ANYTHING BUT A SHRUBBERY!! !